Before an offense can start a season, it needs to have a set of tenets, or offensive principles, in place that allow its players to be creative on the field, while still having a set of guidelines to fall back on. John Galloway, Jacksonville's head coach, takes you into the classroom and onto the field as he teaches you how to build the foundation of an offense. In the classroom, he introduces Jacksonville's fundamental offensive concepts and then discusses the science behind their offense, plus how he puts together an offense from year-to-year based on his personnel. Then, Coach Galloway takes you on the field where he presents 15 drills designed around Jacksonville's offensive tenets and rooted in science; these drills include a progressive series of seven shooting drills that simulate game situations from specific areas of the field. Next, Galloway moves from the classroom to the practice field, where he presents 15 drills, including a progressive series of shooting drills, all designed with Jacksonville's offensive tenets in mind. He runs his players through a series of drills that improve dodging, overhand shooting and off-ball movement, all of which can be adapted to fit your offensive needs and personnel. In this featured drill, the ball carrier's goal is simple - eliminate their defender. Dodging skinny with their shoulders, the ball carrier does everything they can to make their defender's job difficult and draw a slide. When the slide comes, the ball carrier has to escape to the sideline with their feet, roll away and find the open man, all the while keeping in mind that if they bail on the dodge too early, the defense will have too much time to recover. This drill toggles between a dodge up top and from behind the cage. As a bonus component, your defenders can work on effective double teams by turning the ball carrier back to a specific spot on the field with a ready slide. In today's game, a successful goaltender needs to do more than just stop shots. They need to initiate the clearing game, become an offensive trigger and even step out as a seventh defensive player. This video featuring Jacksonville's head coach John Galloway takes you right onto the field and begins building up the skills required to become a 60-minute goaltender. He begins literally from the ground up, introducing the foundations of a proper stance, from the goaltender's feet to their hands. From there, Galloway shifts to an extensive warm-up routine that does so much more than just get a goaltender's body ready for a game. Through a progressive series of drills Galloway develops all of the skills necessary to become an elite goaltender, from making kick saves to suffocating the ball and controlling rebounds. Not content with just a shot-stopping goaltender, Coach Galloway introduces a drill designed to turn a goaltender into a seventh defender who jumps into passing lanes and ends possessions before a shot is even taken. Warming up a goalie isn't as simple as calling out a corner and taking a shot. Through a series of 10 drills, Coach Galloway teaches you how to not only properly warm up a goaltender, but also build up their skill and technique along the way. Starting with Footie, a drill designed to teach a goalie to get their hips through a save in order to control the ball, Galloway begins every warm-up below the goaltender's waist, first rolling balls at the feet and then shooting low corners in the Corners drill. Each drill in the warm-up period is designed to get a different part of the goaltender's body prepared to make a save, ultimately working in unison. Of course, for the goaltender to be able to explode to the ball, make the save and control the rebound, they must have excellent footwork and hip mobility. This next series of drills is all about explosiveness and preparing the body to reset before each shot and then explode to the ball, first with the hands, then the feet, and then the hips. Each drill is designed to eliminate false steps and help the goaltender learn to attack the ball. Finally, recognizing the potential for the goaltender to be an aggressive and disruptive force, Coach Galloway demonstrates how a goaltender can become another defender and shut down an offense before it can even take a shot. Acknowledging the risk but appreciating the potential reward, he teaches a goaltender how to determine whether a ball carrier intends to shoot or pass and then jump out into pass lanes when appropriate to stymie the opponent's attack. This video from Coach Galloway will teach you exactly what it takes to become a championship goaltender as well as how to train elite goalies yourself! The riding game is more than just your attackmen swinging their sticks at long pole defenders. A truly effective ride requires a full-field effort from all of your players, from your attackmen to your close defenders. In this video, the University of Jacksonville's John Galloway presents an aggressive ride high on energy and long on team effort. Coach Galloway ensures that the attackman, the midfielders and the close defenders all know their jobs and work together from one end of the field to the other. In Phase 1, immediately after the clearing team gains possession of the ball, the riding team must do everything it can to prevent transition going the other way. Here, Galloway first walks you through the job of the attackman, emphasizing their need to immediately get in the face of the ball carrier and cover the floater and the clearing midfielder opposite the substitution box. Then, he shows you how the three midfielders drop to the midline, led by the Honcho, and the substitution pattern for getting the LSM onto the field. Finally, Galloway shows how the close defenders "cover the jersey" of the clearing attackman and take them out of the play. Phase 2 begins after the initial ball carrier passes out of trouble and the clearing team sets up its clear. The attackmen drop back to the midfield line in thirds, with the near-ball attackmen jumping the ball carrier with an Ace Approach. The midfielders, meanwhile, also back covering thirds, begin their seesaw technique. The near-ball midfielder jumps up with the defending attackman, as the two try to catch the ball carrier in a double team along the sideline and force a turnover or pass. The other two midfielders, working in unison with the on-ball midfielder, get heavy and deep to prevent any transition, seesawing back and forth as the ball crosses the field. In the event the clearing team gets across the midfield line, Phase 3 kicks in with a "Fire" call. The midfielders and close defenders drop back into the hole and must match up quickly to defend from the inside-out and pipes up. Any poor off-ball pressure can be made up for with strong on-ball pressure as the defense tries to snuff out any odd-man scenarios as quickly as possible. Coach Galloway's approach to riding makes the difficult task of putting together a full-field ride easy for any coach to learn and team to implement. If you're searching for answers for your team's riding effort, look no further! It's not enough to just win the clamp anymore - every face-off player has to know what to do and where to go once they have secured the ball in the back of their stick. In this video, Coach Reisman presents a series of lessons and drills designed to instill, reinforce and perfect the technique necessary to win the clamp, get to your feet and safely escape with the ball. He introduces these concepts through 12 drills, some with multiple variations, that build upon each other in a series of progressions. It all starts with the clamp. Reisman opens the video by discussing and demonstrating the proper technique for executing a quick and strong clamp, which is the first step in getting the ball up and out from the face-off X. Reisman begins with one-handed clamps, emphasizing the importance of the right hand and the need to shoot the pinky into the ball and move down the line. From there, Reisman adds the left hand and continues to layer on important intricacies vital to a successful clamp. He puts these principles into practice with a series of simple drills, each with its own set of variations. Equally as important as securing the clamp is getting off your knee and onto your feet. In this section, Coach Reisman demonstrates how to quickly and properly get off the right knee with a strong left hand punch and a big, explosive step to protect the stick and create separation. While still emphasizing the technique of the clamp, Reisman demonstrates the left hand punch drill, which shows how to crush down on the ball with right hand and punch with the left while exploding out of the stance and taking a big first step. Finally, Coach Reisman introduces the different areas of the field the face-off player can escape to with the ball in their stick. To help the face-off player be ready for the unscripted and unknown game scenarios, he discusses and demonstrates the different types of fakes and feints that can be utilized to throw the opponent off and take the ball anywhere. Reisman also shows how to stay strong on the ball in a 50/50 battle, rotating with choppy steps while looking for help on the wings. As a four-time All-American player in college, Coach Reisman picked up many of the best techniques for winning face-off. This video gives you the opportunity to glean all of his best drills and suggestions and apply them with your own players. Dan Keating is helping turn the St. Joseph's men's lacrosse team into a Northeast Conference power. In 2015, St. Joseph's ranked 12th in the nation in scoring margin and man-up offense, and 24th in scoring offense - which also led the Northeast Conference in all three categories. Take advantage of the many opportunities and options created by each dodge position. 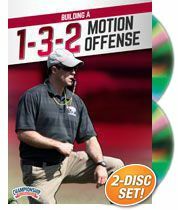 In this two-disc package, Dan Keating goes through the implementation of the 1-3-2 offense, teaching you the part-whole method and building up from small group instruction to a settled 6v6 offense. He covers the different styles and options; then, using principles built into the offense, he has players demonstrate each drill. Finally, he goes over game film and analyzes each principle in action. The second disc features 11 drills that create game-like shots out of typical 1-3-2 offensive scenarios. Each drill is explained in a whiteboard segment to detail the game situation that creates it - as well as the individual skills required of not only the shooter, but the dodger/feeder who sets up the shot. Coach Keating covers the following options of building the 1-3-2 offense from the top: throwing forward, reversing the ball and turning the corner. Beginning with a split dodge into a step away from an oncoming slide, Coach Keating incorporates supporting players and off-ball motion that help teammates understand how to play off each other's movements. An initial "throw forward" to an X attackman becomes supplemented with a crease J-cut, then a rollback and throwback to a following midfielder. Finally, a secondary dodge by the X attackman occurs as the players above the goal continue their motion patterns. With the 1-3-2 principles in place, Coach Keating translates them to off-ball team play during a dodge from behind the goal. Motion, cutting down the pipeline, and looking for the three midfielders from below goal-line extended are covered. Using drills and motions, off-ball attackmen are taught how and where to clear through and follow. Midfielder play is added to the mix in the form of the aggressive "money cut" for a goal, as well as a rotation of players that create multiple threats for scoring feeds or ball transfers. After reviewing the part-whole building of the 1-3-2 offense, Coach Keating runs through how to practice it as a settled offensive unit, building up to a full six-player offensive skeleton that completes the drill cycle. Coach Keating finishes the disc by reviewing game film from the 2014 and 2015 seasons, showing where the principles were followed and missed in the St Joseph's offense. Level up your team shooting drills with this practice package that emulates not only the shots generated by a 1-3-2 motion offense, but the cuts, dodges and feeds necessary to create them. The Kamikaze Drill: emphasizes the split dodge. Coach Keating points out the need to vary speed and direction while keeping your head and eyes up. The 2 Cage Shooting Drill: allows players to focus on their overhand shooting to build the proper fundamentals in shooting over the first cage and down into a second cage.